Thank you to all my customers for their continued support. This ring was one of the last for 2017. I was presented with a design and budget for the creation of an engagement ring. With those variables defined I next discussed the gem type and quality preferred, explaining to the customer what they were selecting. Rather than simply make a decision based on price and size the customer was selecting the quality they were prepared to accept. This ring was to be a diamond engagement ring and with the design, budget and quality of materials confirmed the next task would be to show the customer how those factors affected the design. Given the quality of diamond desired our budget allowed for a .80 carat main diamond. 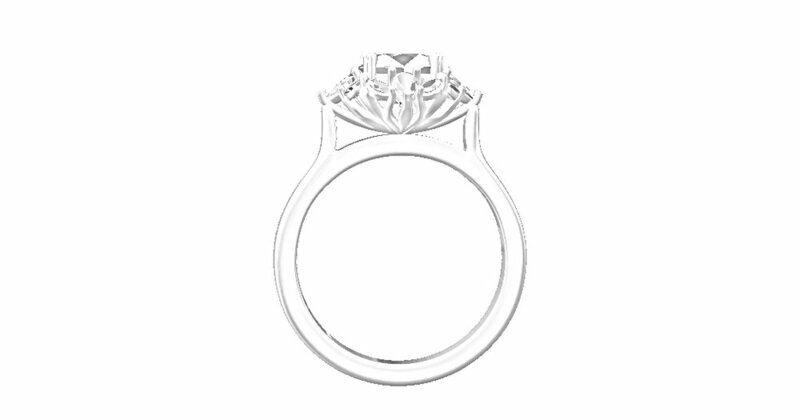 To make the ring exactly as shown in the original design scaled to our finger size would require an over 3 carat main diamond. I needed to see if the customer liked the design using a smaller main diamond. .80 carat main diamond on the left and over 3 carats on the right. The customer did like the design as shown above so my next task was to make sure that I could source the pear and marquise diamonds in the sizes that form the halo of the ring. Often sourcing very specific unusual size small fancy cut diamonds is very difficult in Australia. This is a sign of our shrinking domestic manufacturing industry due to most of the jewellery that is sold in Australia being imported. Sometimes I need to have those specific diamond sizes cut to order which takes time and can be expensive. 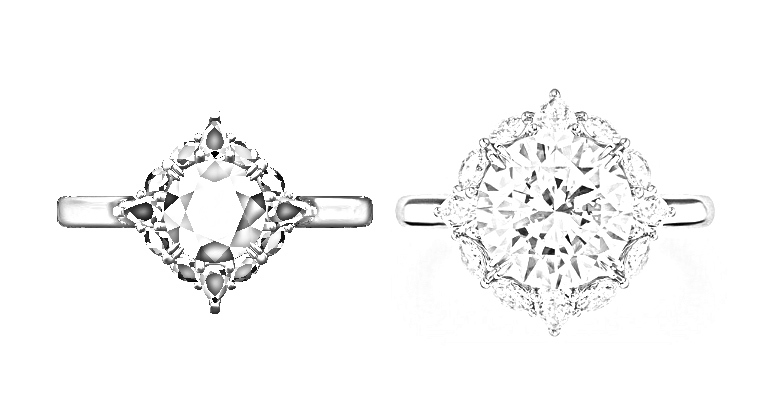 For example the cushion cut diamonds for this wedding ring were especially cut to size as a set. Fortunately I got lucky this time and sourced some diamonds already in stock. Whilst I had a view of the top of the ring to work with there were no photos of the side of the halo. I created a design for the side and bottom view of the ring which my customer approved. My regular customers know that once the design is confirmed digitally I next make a draft of the piece in silver so that the customer can try the ring on to confirm both the finger size and design. In this case I made the draft ring in 18ct white gold and set the diamonds into it. The proposal will be made with this "draft" ring. If either the finger size or design need to be changed after the proposal the ring will be remade to meet those changes. If the proposal goes well and both the design and finger size are correct then the ring has been delivered. If not the ring will come back to me, melted down and remade with any changes she desires. The only possible extra costs to the customer are if major changes are made to the design and/or diamonds/materials used. In some cases changes could also reduce the cost of the ring. My customer has piece of mind with his surprise proposal knowing that he has done his best in creating a ring using quality materials to his budget. If the design is not exactly how she wants it then it will be remade as desired. On behalf of my wife and myself I would like to thank everyone for their support in 2017 and wish you all the best for 2018. Merry Christmas.